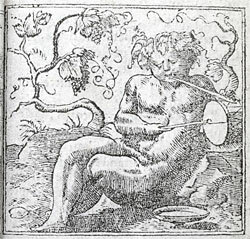 Alciato at Glasgow: Emblem: Sur la statue de Bacchus. Sur la statue de Bacchus. D. Pere Bacchus qui t’ha veu d’oeil humain? Qui ha pourtraict tes membres, de sa main? Quand tu pourrois de Nestor passer l’eage? D. Que signifie en toy couleur de feu? Es tu bruslé en ce terrestre lieu? En l’eau plongé fut mon corps, plein de pouldre. Et estre prins: sans que l’on soit trompé? Car ainsi boire est meilleur, & plus beau. Tu coules doulx. Biens aysez ne sont pas. tant par petite mesure, que par eau. 1. For a description of Bacchus, see Ovid, Metamorphoses 4.4ff. 2. Praxiteles. This artist fashioned a famous group of statues in bronze depicting Bacchus/Dionysus with Drunkenness and a Satyr. See Pliny, Natural History 34.19.69. 3. Ariadne, daughter of King Minos of Knossos, who helped Theseus destroy the Minotaur, was taken by him to Naxos and there abandoned. Dionysus, the young, exotic and beautiful god of wine, rescued her and made her his bride. See Philostratus, Eikones 1.15. 4. Nestor, king of Pylos, who had outlived three generations of men and was a proverbial example of age. 5. The god was represented with ram’s or bull’s horns, symbolising power and virility. Under the influence of wine the weak imagine themselves strong and powerful: see Horace, Odes 3.21.18.